Using the worksheets and the audio material of your Japanese proficiency level, you will study them whenever it is convenient for you (self-learning). 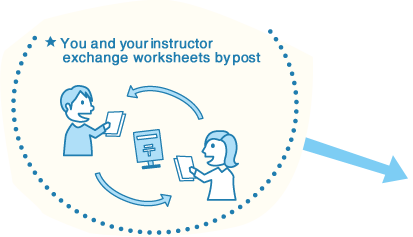 After completing worksheets, you send them to your instructor by post and have them graded. You then receive the graded worksheets, and correct your mistakes so that you can ensure you fully master each study topic. Through such self-learning, by reading, thinking and solving questions on your own, you can master Japanese. In addition to these, in the "online reading lessons," you read aloud Japanese texts so that your instructor can check this and teach you the correct Japanese pronunciation. You can take the reading lessons provided through the Internet by applying at the time of your enrollment in the Correspondence Course (no additional fee is required). The lessons are held twice a month, about 20 minutes per lesson. From your instructor, you will receive one-on-one instructions in oral reading. 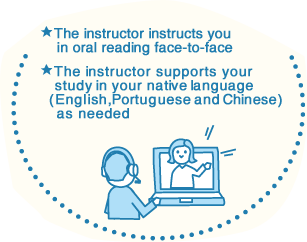 If necessary, your instructor will communicate in your native language to support your study effectively. You are responsible for the PC, microphone and headphone costs, as well as the Internet connection fees. 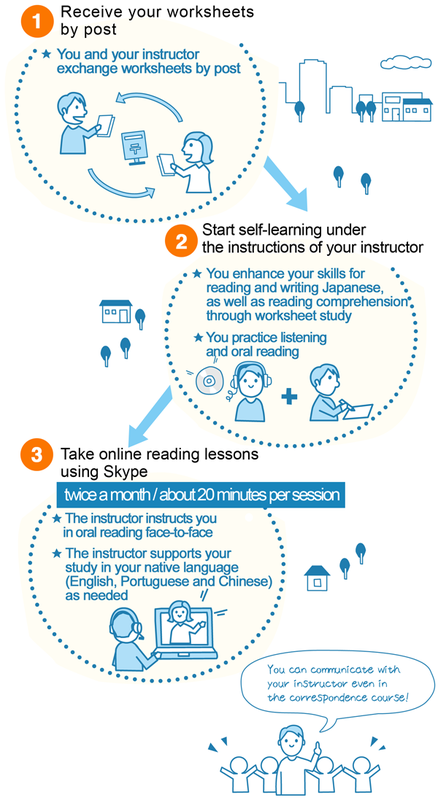 If you are not able to use Skype due to the specifications or compatibility of your devices, you cannot take the reading lessons. I need to study per week? 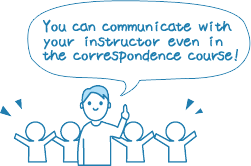 In the Correspondence Course, you can study the worksheets sent to you by your instructor on any hour of any day of the week in your spare time through self-learning. You will learn effectively by studying every day. Each time you study, you will work with about five to ten worksheets. The length of your study time is usually between about thirty minutes to one hour including the time for the oral reading practice. You can freely set your study time in accordance with your own rhythm and pace. In order to help you continue your study comfortably, your instructor will support each student in various ways. When grading your worksheets, your instructor will also check your study progress and make necessary adjustments, so that each student can learn using the worksheets that are the most appropriate for their level of mastery. In the online reading lessons, your instructor will teach you oral reading on a one-on-one and face-to-face basis. They will check your pronunciation and fluency of reading, give you advice, and answer your questions related to the study content. When necessary, the instructors will communicate with you in your native language (English, Portuguese and Chinese). lessons is included in the monthly fee. 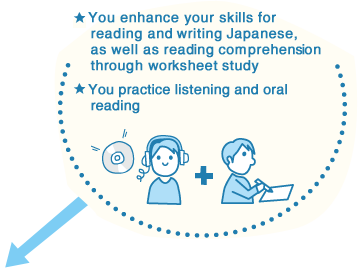 Please read the "Kumon Japanese Correspondence Course Regulations" and then fill in the application form.